I receive Google alerts when news of my books comes up on the web, and in the past couple of months, the alerts have been screaming in at a record rate — almost all appearing to be download sites for my books, which, I can assure you, are completely bogus. There may actually be some pirate sites among them, where copies of the book may be acquired — illegally, of course, but the vast majority of them appear to be links that will take you to malware sites, where your device will almost certainly be compromised by some hellish bug or another. I'd never even click on one of those links, much less attempt to actually download a book. My available titles can all be acquired, quite legally, at legitimate sites such as Amazon.com, Barnes & Noble, and Books-a-Million, not to mention directly from publishers such as Crossroad Press, Dark Regions, Wildside Press, et. al. Purchasing from them ensures you'll get what you pay for, and that ye author will receive his due royalties. And, of course, at my website, www.stephenmarkrainey.com, you can get all the information you can stomach about my work, along with links to order from the most legitimate sources. As I said, this is probably a superfluous admonishment, but then I never cease to be surprised by the games people play, every night and every day now. I mean, look at certain of our presidential candidates. Stay tuned, there will be a special promotion or two coming along soon, and I'll be posting details right here. It was not even a particularly harrying morning — which is, I expect, the whole problem, since if it had been, I would not have lost my focus and walked off without feeding the cats. I got up, anticipating a nice geocaching outing, with plenty of time before I had to walk out the door. 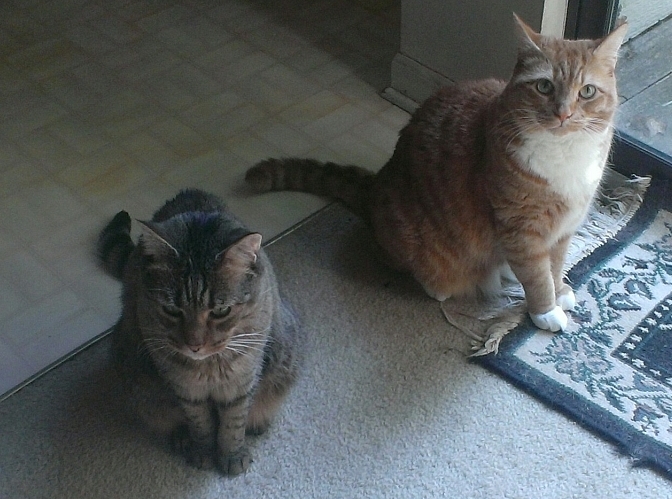 As always, the cats herded me straight toward the kitchen, since — according to them — it had been a month since their last feeding. However, I bade them wait, for it was more critical that Dad get his coffee cooking first. Coffee now in the works, I notice the sink is full of dishes, so I start to put them in the dishwasher, only to find the dishwasher full of clean dishes, so I unload the dishwasher, after which there is coffee, so I pour the coffee and commence to loading the dirty dishes in the dishwasher, at which time I get a message from one of my geocaching partners stating they can't make it, which reminds me I haven't downloaded the day's cache info into my GPS, so I go upstairs to download the caches, then write a reply to our errant friend, only to receive an important writing-related email, which I immediately reply to, only to notice that time is scurrying ever onward, so I rush to get dressed, remembering that, since it's a six-mile hike, I will need plenty of liquid refreshment for the trail, so I pack up some liquid refreshment and then figure that I'm also going to need my bug spray, so I go out to make sure I have bug spray, and then realize I'm actually running a little late, so I confirm I have all my geocaching supplies together, lock up the house, get in the car, and go caching, and that is why I am in dutch with the boys. and I encountered along the trail. Happily, I don't think I'm in dutch with him. I bet you think you're looking at a very red-tinted photo of Droolie up there. Not exactly. You're looking at a very red-tinted photo of something that ought not be. Look down near the left-hand corner of the pic. 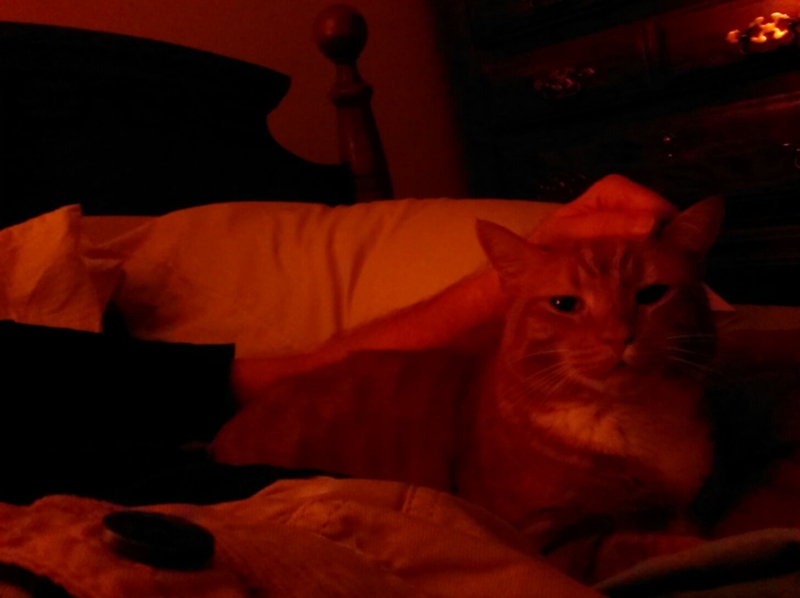 There's a dark, solid-looking round thing on top of the covers, which — given the position in which I was lying in the bed — would have been resting on my stomach. And clearly visible to me, as my head was propped up on the pillow, just out of view of the camera lens. It looks like a hockey puck. Or perhaps a lid to an insulated coffee mug. Its left edge is reflecting the lamp light from the nightstand. It casts a shadow. I took this photo of Droolie the other night and was just going to delete it because the lighting was so funky. But then I noticed that object in the corner. And it's no use, I've got to post this: at the time, there was nothing there. 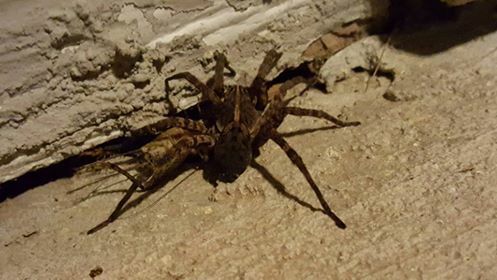 Nothing like that rested on the covers, in the bed, in my bedroom, in my house. In that bed, there was Droolie, and there was me. That dark object, whatever it is, was not there. I was on the phone with Ms. Brugger at the time, and I immediately remarked to her, "What the hell is that thing?" In no way does it appear to be an optical illusion — no gap in the covers, given some sense of dimension by the lighting. There's no weird trick of perspective, evidenced by the fact that the focus is consistent across the frame. There was nothing there. Given where my head was in relation to that object, there's no way I could not have seen it, if something was actually there. There wasn't. Subsequent photos revealed nothing on the covers, so I didn't save them. I tore apart the bed — the whole room, basically — to see if some object, something which might explain that, might reveal itself. Nope. So I'm left with a photo of something I can't explain, and while you may have no reason to even believe it, I'm telling you God's honest truth: there's something in that photo, and I cannot account for it. No doubt there's some prosaic explanation, but I don't know what it could be. Mainly, I have this fear that some ghostly hockey player, somewhere, is missing his puck, and may be in foul humor over it. I'm pretty sure I don't want to meet him. 'Twas a lovely day for Three Old Farts — Diefenbaker, Robgso, et moi — to venture forth to Hillsborough for a bit of geocaching, chowing on BBQ, and snake hunting. Well, we didn't exactly set out for the latter, but we did chance upon a happy little copperhead lounging on the trail near the Old Oconeechee Speedway. He attracted some crowd of onlookers, but Diefenbaker helped him get across the trail without ill effect to either snake or to hikers. I've encountered numerous copperheads at close range over the years, and thankfully, much like black widows — our other most common venomous creature around these parts — they generally do their best not to chomp on you. My favorite encounter with a copperhead was about four years ago while caching in a wooded area not too far from home. I was making my way down a rocky hillside toward a creek that flowed into a long culvert, which I had to enter in order to reach the cache. I stepped on a large, loose rock, and what should emerge — or perhaps I should say erupt — but the biggest copperhead I had ever seen, with a body over four feet long and a good two inches in diameter. It shot like lightning into the creek below and vanished from my view. Realizing the snake could have easily chomped on me had he so desired, I was a little reassured that he was more keen on putting some space between us. The pipe I had to enter lay about twenty feet upstream, and I hoped at this point that my lengthy friend might have proceeded downstream. Undaunted, I made my way into the dark pipe. Nope. Sir Copperhead has gone inside the pipe to mope, and now finds himself incensed that the tall dopey creature, rather than fleeing screaming, is entering his domain. 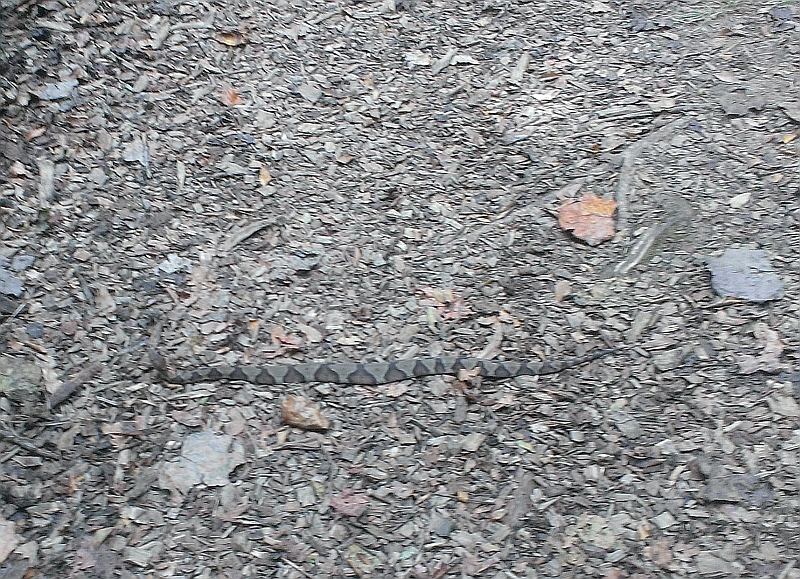 Snake, curled up some ten feet away, takes it upon himself to lunge at me, forcing me to back up a few steps. Fortunately, the creek is full of large rocks, so I heft one of them and chuck it into the water in front of the snake, hoping to deter him. Oh, no, he'll have none of that. In fact, by now, he's kinda mad at me, so he lunges again, this time stopping only a couple of feet short. I grab another rock, shove it at him, and this time, he's splashed up into the air and comes back down in the water six or seven feet away. He coils up to gather his wits, and I take this opportunity to vacate the creek, hoping he hasn't called in his friends as reinforcements. Thankfully, no, so we bid each other cheery farewells, all is forgiven on both ends — well, at least on my end — and I promise not to return until hibernation season. 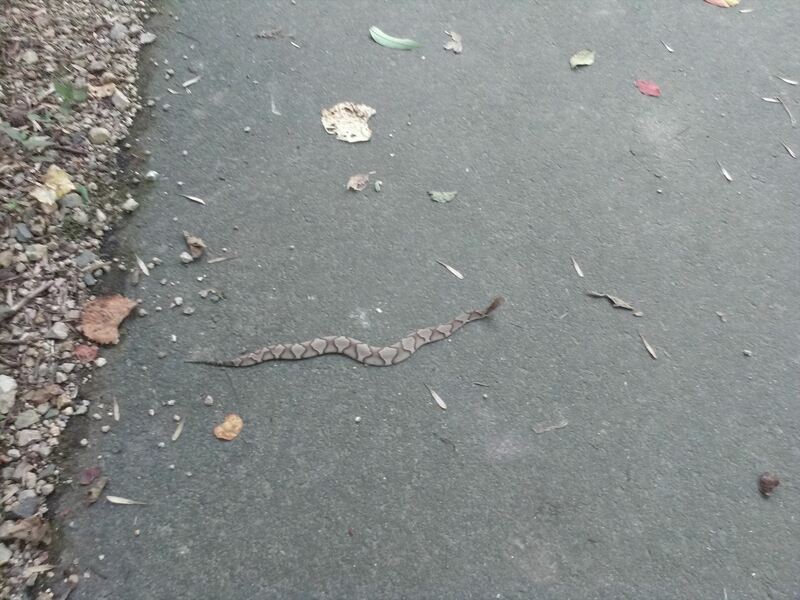 Just last week, Ms. B. was taking her trash out and nearly trod upon a baby copperhead reclining on her carport. They really do seem to enjoy our company, but I don't recommend petting these nice little guys, however great the temptation. The rest of today's geocaching expedition was fun enough. We got in several decent little hikes in the woods, found a night cache in broad daylight, and enjoyed some first-rate beef brisket at the Hillsborough BBQ Company. Bumped my total number of finds up to 9,027. A couple of old farts I was caching with today. And you thought snakes were dangerous! expect to find a bench in the woods. 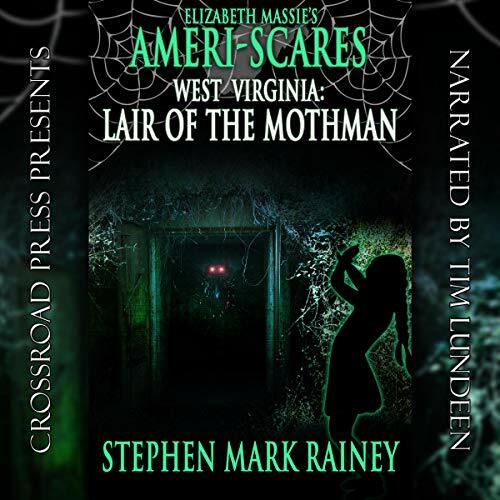 As many of y'all know, scary fiction and music are among my passions, and while I work at creating the former almost daily, it's less common for me to break out the git-fiddle and make a scary racket. Still, now and again I am known to do this thing and inflict some lovely pain and suffering on an unsuspecting populace. So shall it be this coming Friday, September 16, at The Daily Grind in Martinsville, VA. From 7:00 PM to 9:00 PM, The Daily Grind is holding a Songwriters Showcase for local musicians to perform some of their original compositions. Now, I haven't written music in decades, but there was a spell back in the 1980s and early 90s where I composed a fair number of guitar-and-vocal tunes, many of them — I'm sure your shock is palpable — featuring scary themes. Come Friday, I'll be performing a few of them. You folks in the area, please come by and feel free to hurl, heckle, and chuck things. It's all appreciated. The Daily Grind is located at 303 E Church St, Martinsville, VA 24112 (see map below). Just for good measure, here's a video from two or three years ago of Ms. Brugger and me belting out our version of October Project's "Bury My Lovely," though — sadly — she will not be in attendance this coming Friday. And too bad for me, as she improves my stage presence by a couple hundred percent. I want all your garmonbozia. 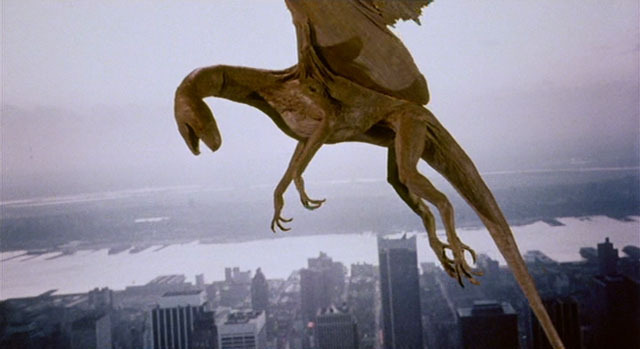 Back in the mid-1980s, I think it was when I lived in Chicago, I caught the video of Q, a stop-motion-animated monster flick written and directed by B-movie guru Larry Cohen (It's Alive, It Lives Again, Island of the Alive, The Stuff, The Phone Booth, et. al.). I thought it was reasonably good fun, but I never saw it again afterward, and pretty much forgot it ever existed. A couple of weeks back, the movie's name popped up on my computer, I think while browsing titles to add to my Netflix queue. I figured, what the heck, I'd give it another look, as I do love my B movies, especially the flicks I remember from the heyday of the drive-in movie theater. Now, I never saw Q at the drive-in, but this one is consummate outdoor movie fare. It came out in '82, when drive-ins were already on the decline, so it missed the glory days of the prior couple of decades, but as pure shlock, Q fits right in with the best (or worst) of the grindhouse pictures of the 1960s and 70s. From the opening notes of the score by Robert O. Ragland (The Touch of Satan, The Thing With Two Heads, Grizzly, et. al. ), you can smell the popcorn and exhaust fumes. The film's production values are anything but extravagant, but its Manhattan setting offers some intriguing scenery, everything from intimate shots of its seediest backstreets to panoramic aerial views of New York City in all its splendor. 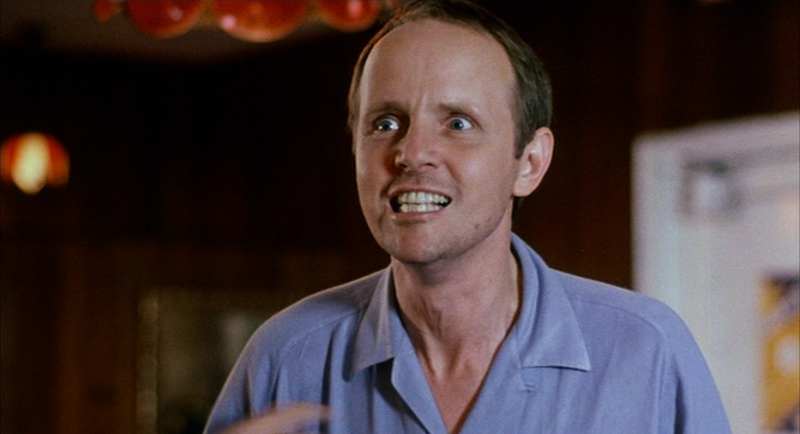 There's enough gore and coarse language to justify its R rating, at least for its day; some entertaining, if sparse special effects; and... Michael Moriarty. A handful of other recognizable names/faces appear here — David Carradine, Richard Roundtree, Candy Clark, and Eddie Jones — but Moriarty, one of Larry Cohen's staple performers, chews and chews his way through this movie, playing manic-depressive two-bit crook Jimmy Quinn, who, despite more than plentiful foibles, might just become the savior of the Big Apple. I recall during my first viewing of Q, way back in the day, it struck me as mostly too talky, with people scenes aplenty and monsters too few. But with the perhaps questionable benefit of age and experience here, I can tell you that Moriarty — a reliable talent in countless movies and TV series — is a joy to behold, his character offering up dizzying mood swings, ridiculous soliloquies, and an almost likeable manner, despite needing his teeth punched out in every other scene. It's Moriarty more than the monster that drives the movie's momentum, such as it is, and it can safely said that, without him, there probably wouldn't be enough here to justify paying for the popcorn. It goes like this. People are disappearing from unlikely places — window washers from their precarious 40th-floor perches, young women sunbathing on rooftop terraces, construction workers from high-rise girders. At the same time, several mutilated bodies turn up, all bearing all the hallmarks of Aztec ritual slaughter. 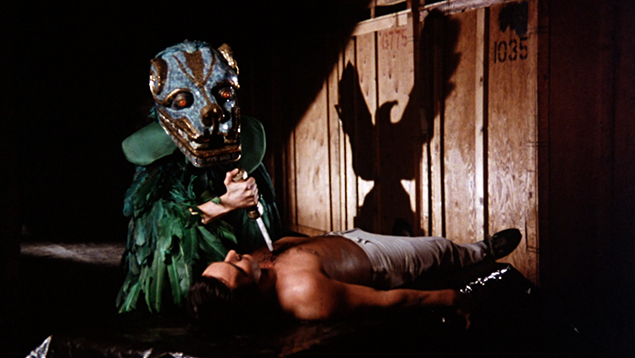 NYPD Detectives Shepard (David Carradine) and Powell (Richard Roundtree) are at first baffled, but with the help of young Quinn, who, during his escape from a bungled diamond store robbery, sees the murderous beast up close and personal, they piece together an unlikely scenario: someone is conducting ritual murders in order to placate the fearsome Aztec serpent god, Quetzalcoatl, who has decided to pay the Big Apple a big old ugly visit. 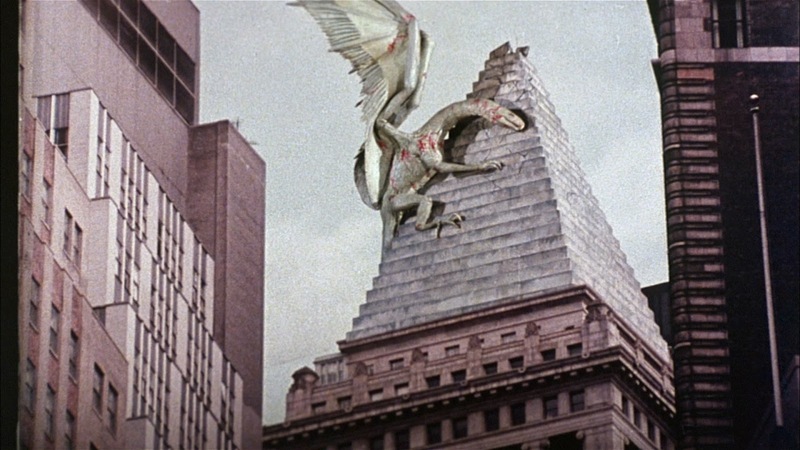 Indeed, the winged serpent is alive and quite animated (courtesy of David Allen, Randy Cook, and Peter Kuran), having taken up residence in the uppermost reaches of the Chrysler Building. Once it's ascertained that the beast exists, they need a plan to destroy it. And who should come up with the means to do so but our all-but-failed, mostly cowardly hood, Mr. Jimmy Quinn. Larry Cohen enjoys his police procedural stories, and Q's extensive police drama is well enough done, with Carradine and Roundtree occasionally expending a modicum of energy in otherwise dry, two-dimensional roles. At one point, after a particularly close call with the monster, Carradine glances at his partner, looks momentarily bemused, and then says, "Big!" with a little chuckle. I don't know whether the scene was ad-libbed, but it does present a welcome moment of spontaneity from someone other than Moriarty. With Q, it goes without saying you're not getting sophisticated entertainment, but if you're a fan of stop-motion animation, the critter is right fun, and for the people scenes, Michael Moriarty — with the tiniest bit of help from Carradine — adds energy by the bucket load. I'd put this movie neck and neck with The Crater Lake Monster for cheap, fun, late grindhouse–era entertainment. Not one I'm likely to watch again anytime soon, if ever, but at least it made for one evening of solid amusement. Jimmy Quinn has a brilliant idea, or a million. Have a heart, Mr. Aztec High Priest dude! small arms fire inflict Q with a case of heartburn. Now, on the writing front, I've been really cranking it these past few weeks. I just finished new short stories — actually, fairly long stories — for a pair of anthologies I was invited to, the second of which went out to the editor last night. If you've checked in here recently, you've probably seen that Young Blood, my novelization of the Smith Brothers' indie vampire flick, was recently released, and that Return of the Old Ones, featuring "Messages From a Dark Deity" is on deck. Lots to do this weekend, some fun, some the usual responsibilities with Mum. At least it's a long one.